An imposing mixture of nature, culture, healthy activities and cuisine makes it easy to learn to love the Waldviertel as a unique tourist destination. This region of Lower Austria will enchant you with the clarity of its air and its impressive peace and quiet. The Waldviertel Railway runs through this varied region in Austria's high north. The first station is Gmünd, the gateway to the Blockheide Nature Reserve. 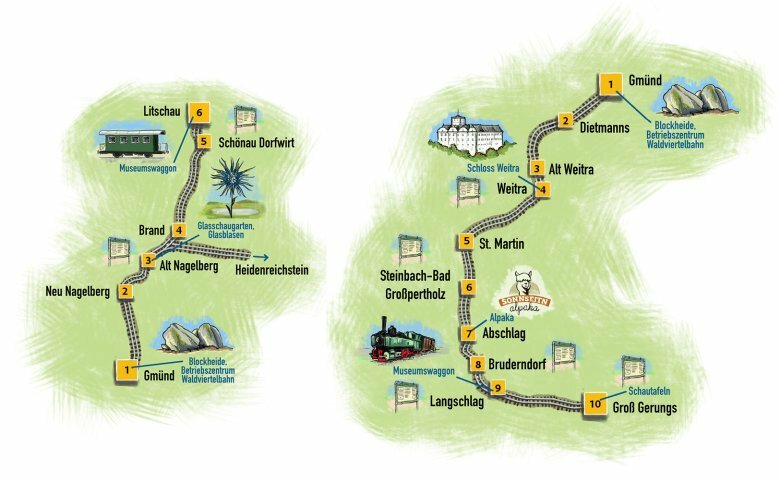 Relax in the Sole-Felsen Spa or perhaps take a stroll and explore the Schlosspark, the castle grounds in Gmünd. There is something for everyone here. You can learn about the traditional art of glass-making in the Waldglashütte. Glass is made here in the traditional ways and decorated with special engraved motifs, painted or polished to a high gloss. Alt Nagelberg is the centre of the Waldviertel glass industry. Here beautiful works of art are created from a simple raw material. In the Apfelthaler glass works you can experience the art of traditional glass-blowing at first hand. In the Museum of Glass Art you can discover more about the history of glass. Stroll through the impressive Glass Art Garden beside Alt Nagelberg Station. Discover the restored original train station on your journey. In Schönau bei Litschau you can visit the old railway station and learn more about its history thanks to the information panels. The climatic spa at Litschau offers an impressive number of open-air attractions. Pure regeneration plus boat hire awaits you at the Herrensee lake. And the experience lido invites you to while away the time in comfort. Culture is provided by the local museums, which offer a spectrum of different themes. The two museum railway carriages are an especial highlight. Gmünd is also the departure point for the southern branch of the Waldviertel Railway. Alight and enjoy nature. Enjoy healthy air and undisturbed nature while you hike, cycle or mountain bike. This tranquil place is memorable for the idyllic Heinrich experience hiking trail and the pilgrimage church of Our Lady, which dates from the 12th century. The oldest brewery town in Austria invites you to while away a little of your time. On the Weitra Beer Trail straight through the historic Old Town you discover more about brewing tradition. Weitra Castle, which brings you closer to the more than 800 years of the town's history, is particularly well worth visiting. Peace and quiet can be found in the first organic milk village in Austria. The landscape, which is predominantly farmed organically, is located in the Lainsitztal Nature Reserve and is the ideal departure point for hiking to the Nebelstein. In the downhill and cross-country skiing centre, on the natural toboggan run and in the Nordwald Nature Reserve, activity and the enjoyment of nature head the menu. The Moorbad Großpertholz spa hotel offers pure relaxation. Directly beside the railway halt you can visit the Schwammerlschnitzer, the mushroom carver. Here you can discover paths through romantic forests around Abschlag. You can marvel at more natural beauty in the nearby Nordwald Nature Reserve. Abschlag is the home of the Waldviertel alpacas in the Sonnseitnhof. Here in the midst of nature there is something for those seeking peace and quiet as well as for those eager to be on the move. The picturesque cross-country ski trails of the Aktivwelt Freiwald are the ideal place for cross-country skiing and skating. You can discover more about bee-keeping from the local bee-keeping association at their taster bee-keeping events. At the Railway Museum you can visit the Museum Railway Wagon. With its strength arena, its park for improving motor skills and its cardiovascular centre, Groß Gerungs offers plenty of activities. Enjoy a relaxed stroll through the historic town. The information panels detail the history of the Waldviertel Railway.